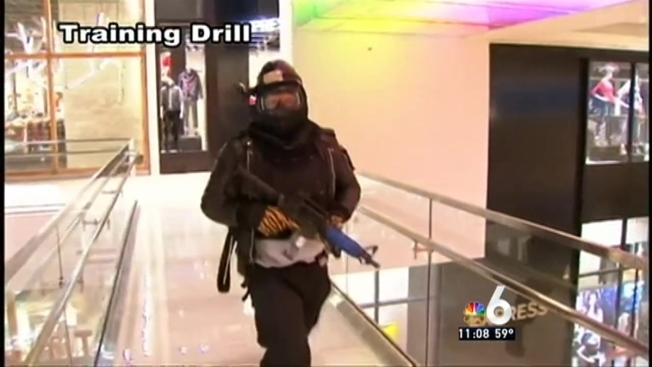 The Miami-Dade Police Department held a training exercise at a South Florida mall Thursday to simulate an active shooter situation. Dozens of members of the police department and SWAT team stormed the mall, firing weapons at will as part of the drill. "As we practice and enhance we hope to make this community safer by knowing what to do if the real thing happened," Miami-Dade Police Sgt. John Barrow said. In addition to helping police, the drill is also to help inform the public. Police want people to know that if they're ever caught in a shooting situation, communication is key to keeping safe. "Part of the response is us and the community and the media to make sure everyone is aware," Barrow said. Police gave several tips that could help someone in a shooting situation, including listening to loud speakers for announcements from authorities, never running toward the sound of trouble and don't play the hero. The best way to help out is by remembering every visual detail so they can be relayed to police. Above all, it's best to hide, take shelter and let police do their jobs.